eTV offers New Zealand educators the widest range of national and international video library services. When you Subscribe to eTV, you get access to TV Recordings and Curriculum Collections, Zaption Basic is free for staff, logins can be given to students as well as staff and Single Sign-on is available. eTV captures TV programmes daily from Freeview, SKY and International Channels. Subscription gives unlimited access to these and to the back-catalogue of recordings made since 2008. Teachers can request recordings to be made for them of any programmes of interest. 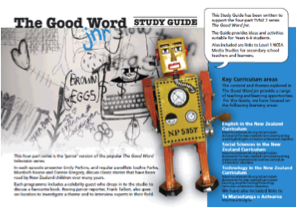 Thousands of short programmes and clips sourced from around the world, have been matched to the New Zealand curriculum. Short, snappy and to save time in the preparation of units and lesson plans. Teachers can request us to capture legally posted online videos from YouTube. You can use the Library Upload service to manage and post any videos to your own Library Catalogue, which is secure to your staff and students. Subscribers receive 10GB of free hosting space in the Library. Go to the Library Hosting page for more info. Pricing for Subscriptions newly taken or renewed in 2015 is – TV Recordings and Curriculum Collections - $2/EFTS (unchanged). A simple one off Sign up fee is applicable upon joining eTV, this includes a full training session provided to your staff. If your institution wishes to activate and turn on SSO without an IdP, there will be single set up fee of $500 to cover all technical support and development during the set up phase. eTV’s Enhanced Video Annotation service brings interactivity to online videos. EVA revolutionizes online video for education. Teachers use EVA’s intuitive web app to quickly add images, text, and quizzes to existing videos in eTV. The result is an interactive learning experience that transforms video from a "lean back" experience to an engaging "lean forward" activity. With EVA’s analytics, instructors get immediate feedback on how students interact with the content and understand key concepts. All staff and students at eTV Subscribing institutions get a Free Basic account. EVA is available immediately following login to eTV. EVA’s Free Basic service enables all users to create and access view-only EVAs at no cost. A low cost Subscription gives EVA creators access to the data created by EVA response tools, quizzes and question based interactions. Login to see detailed subscription information which is available under the About EVA button. 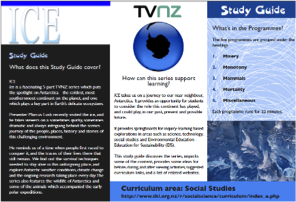 eTV provides schools with ongoing access to many New Zealand-produced series. To enrich this service, we are pleased to offer a curated view of the study guides which accompanied some of these series at the time of broadcast. New Zealand television has a special part to play in our increasingly globalised world. Locally-commissioned series can have enduring value not only because they share the stories of people, knowledge and activities which are uniquely our own, but also because they capture moments in time. These can sometimes reveal surprising insights into how we thought, what we did, what we knew, what technology we used, how we spoke, and what attitudes we held. This means the series can continue to support powerful learning opportunities for schools long after they first screened. This in-depth 4-part TVNZ series, explores the development of New Zealand’s roads, rail, power, and shipping and transport infrastructure. This TVNZ science and technology series for young people entertains by exciting the imagination and encouraging the involvement of inquiring minds. In this fascinating 5-part TVNZ series, presenter Marcus Lush puts the spotlight on Antarctica - the coldest, most southernmost continent on the planet, and one which plays a key part in Earth’s delicate ecosystem. In this 4-part 'junior' version of the popular The Good Word television series, young people interview authors, review books and unpack the world of publishing. his 6 part series, introduced by well-known New Zealanders, takes a person tour of the arrival of English, Scottish, Irish, German, Dalmatian and Chinese communities. 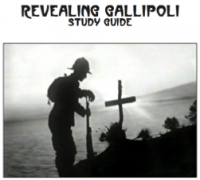 Revealing Gallipoli was produced to coincide with the 90th anniversary of the ANZACs’ landing at Gallipoli. It tells the story from the points of view of the different countries involved, and from the perspectives of different groups of people (from politicians and generals to soldiers and sailors). 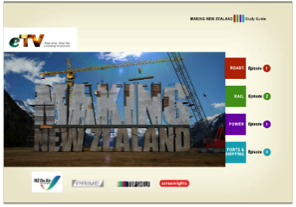 eTV sincerely acknowledges the role of the production companies, broadcasters, Screenrights and NZ On Air, who contributed to the development of the guides. Watch over 30 Freeview and International Live TV channels, and recorded programmes from NZ’s biggest On-demand platform, over 50,000 videos, with 40-50 programmes added daily. The Set Top Box is 100% online, and can be connected by LAN or to a wireless network. It can therefore be located in any room without the need for an antenna connection. It also comes with a built in Browser so that users can navigate the web on their TV. While eTV is used in the classroom by teachers, most use happens at home, and not everyone wants to watch TV content on a small screen. Teachers and students from eTV subscribing schools and tertiaries can access the eTV On demand service through LinkTV’s Set Top Box using their eTV login. If your school subscribes to eTV it will have a Screenrights Licence, so all your staff and students can legally access the on demand video content eTV records every day. If your school does not subscribe to eTV On-demand, all the live channels are available on the eTV Free service and can be watched on the Set Top Box. Last year eTV received Charitable Trust status and together with LinkTV is now pleased to be able to offer a fundraising opportunity to our Subscribing Schools. The Set Top Box has a retail price of $199. eTV will provide a 30%“cashback” to Schools - $60 for each Set Top Box sold. These funds will be remitted on a monthly basis based on the previous month’s sales. To help promote the eTV service running on a Set Top Box, each participating School will be given one Set Top Box for free so staff and students can see exactly how it works. Of course, you can buy more at the discounted rate for use in the school. Get In Touch for information on how you can unlock this amazing offer. eTV’s Free Service. Join now for free and experience the added value eTV can bring to your teaching resources. The free sections - Live Streams of selected television channels, and the Library, do not attract any sign up or ongoing access fees. To get a login just click the Login button and select “Not Registered Yet?”. All NZ Freeview selected international channels are streamed live. There is an 11 hour rewind so that users can catch up on recently broadcast programmes. Library videos come from eTV, educational organisations, companies, foundations, government departments who have produced programmes that they want to make freely available to educators. Secure Library Hosting makes videos available to your staff and students, All eTV Free Service Members get 5GB of hosting space for free. Take advantage of our no-obligation, three-month evaluation of TV Recordings and Curriculum Collections. Access to the TV Recordings Service requires your School to hold a Screenrights Licence. If your School already holds a Licence, great! We can open a Trial right away. If not we can give you a free Trial Screenrights License so that you can assess the value for teaching and learning of being able to access all our TV Recordings and Curriculum Collections videos. Please click here for complete Screenrights Licence information. eTV is a personal, easy to use and effective online video library for teaching professionals and their students. eTV adds rich metadata relevant to the NZ curriculum for fast and effective searching. eTV is an ad free and “copyright safe” area for students and staff to go and find content easily. All content available in eTV is copyright cleared for legal use under Creative Commons and/or Screenrights Licences. Videos are available to be viewed directly online, by Embedding Codes, or by Downloading. eTV works with standard web browsers on any Mac, Linux or Windows PC, iPads, Android tablets, and mobile smartphones. 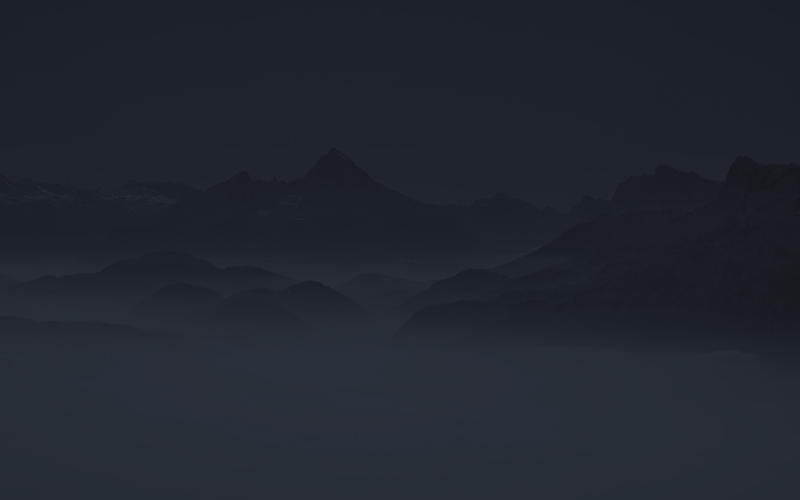 There are no local servers to buy and hardware/software management is not required. Users with Admin rights can access the Reports and Management Section where they can manage users’ access levels and generate activity reports. The eTV User Management system sets up Staff and/or Student Users in the system with personal logins. Users can self register and be sent an email with their login details automatically. eTV offers Single Sign-On access and recommends that any School wanting to implement SSO uses an Identity Provider (IDP) such as 'Our School' . eTV distributes programmes recorded off-air from domestic and international television channels and Internet channels, that can be viewed and downloaded under the terms and conditions of the Screenrights Licensing Scheme. The Education Television and Video Communications Trust was established in June 2010 by e-cast Ltd as a not-for-profit Charitable Trust to manage the development and distribution of the off-air broadcast recordings services to Schools, Kura, Polytechnics, Wananga and Universities throughout the country. The Trust has been approved by the Minister of Education and Screenrights to operate as an Education Resource Supplier under the Copyright Act S.48. As part of eTV’s Charitable work, Schools have free access to Live-streaming TV Channels, a Library of educational videos and recordings from relevant educational conferences and events. Educational establishments throughout New Zealand can access this unique service to select relevant content covering all curriculum subject areas. eTV's digital recording, cataloguing and distribution of communication works offers an unprecedented opportunity for teachers to access, manage and deploy compelling content to support and enhance learning outcomes and achievement levels. eTV will support the use of media in teaching and help teachers improve student engagement and learning outcomes across the Curriculum. eTV will continue to develop new web features and functionality so that the eTV User Interface website becomes the primary service for educators and students to access, upload, and interact with all forms of video in the education process. eTV will focus on adding to the number and range of broadcast and non-broadcast video content to its digital repository to add value to eTV and to increase the number of educational clients using the service. eTV will promote and support related development of the service to provide the educational sector with specific opportunities and support related to the use of video and television in the Curriculum and beyond. eTV is a leading agency supporting the development, promotion and adoption of digital video distribution and utilisation technologies within the New Zealand education sector. Our staff value our customer relationships highly. We understand education and have experience in education and teaching. We are here to help make the process of teaching and learning easier and more enjoyable. eTV is just a great service. I found myself teaching junior social studies for a couple of terms last year and I really don’t know how I would have managed without eTV. There are very few paid services which I would recommend to schools, but this one is essential. We are thrilled to join forces with eTV to bring interactive video to New Zealand. eTV has an impressive video platform, and now, with just a few clicks, you can bring any eTV video into Zaption, giving teachers and trainers a whole new set of tools to engage students and track how they learn with video. Send us a message to say hello. We'd love to hear from you! How did you hear about eTV? If your institution uses Single Sign On, then after entering your School/Institution issued email address, you will be redirected to that login page. You may be able to get a login automatically to eTV. Please enter the first part of your email address only. We do not accept self registration for students at this shcool. OOPs! Your School is not set up for Self Registration, which enables Staff to obtain an eTV Login automatically. To request Self Registration to be activated please contact us here.